By Mandalit Del BarcoJohnny Depp, who helped create Tonto's character for the new movie, says he grew up watching reruns of the TV series, which he says was pure entertainment. "But even at the ripe old age of 5 or 6 or 7, watching that on TV, I had the very distinct feeling that there was something very wrong," he says from a hotel room in Lawton, Okla., before a special screening of the new movie. "Tonto never deserved to be called a sidekick." Depp wanted to play Tonto as the Lone Ranger's equal partner. "In my own small way, it was my attempt to right the wrongs of what had been done with regards to the representation of Native Americans in cinema." Tonto is first seen in Disney's new The Lone Ranger on display at a sideshow diorama labeled "noble savage." Depp says the character is meant to be humorous—the Lone Ranger even kids him about the word Tonto meaning "dummy" in Spanish. Depp's Tonto is a deadpan spirit warrior from the Comanche tribe. The 1950's Jay Silverheels' Tonto was calm and stoic, wore his hair in a braid and donned a headband and a buckskin vest. But Depp's new Tonto is tattooed and shirtless. His face is painted white with black stripes. And on top of his head sits a dead black crow. "Going against the grain of what had been done before, I knew it would require a very, very important iconic look," says Depp, who says he took it from a painting by artist Kirby Sattler, which he saw on the Internet. "It was a warrior, and at first glance I saw a face split into quarters. I thought, 'Wow! That's a very interesting concept.' Then there was also a bird flying behind the guy's head, the warrior's head, and I thought, 'Wow, that's [an] amazing bird.' Well, he's not on his head, he should be on his head, as an extension of himself, a warrior, his spirit guide." As I've said before, Johnny Depp "respects" real Indians by fabricating a phony Indian. Nice. But it's comical to hear Depp talk about it in his own words. Tonto's "spirit guide," aka his "animal totem," sounds like it came straight from a New Age ceremony. Or a Y-Indian Guides ceremony. It's a stereotypical notion that doesn't exist in most if not all Indian cultures. The display of face paint design crow feathers and crow headdress in the painting "I AM CROW" is an illustrative interpretation of the inseparable relationship between the Native American and their spiritual and natural world. I purposely do not denote a specific tribal affiliation to my paintings, allowing the personal sensibilities and knowledge of the viewer to create their own stories. 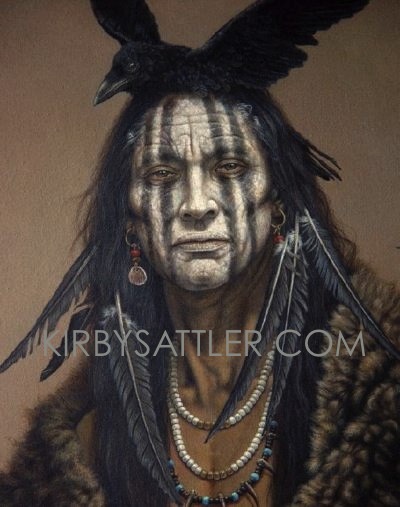 -kirby sattler"Crow headdress in the painting"...case closed on that point. If the bird were behind the man's head in Sattler's painting, Depp would be even more wrong. It would mean he misunderstood Sattler's fantasy painting and made up the headdress entirely on his own. "I saw something in a white man's painting, but that wasn't fake enough, so I doubled down on the fakery. That's how much I respect Indians!" So there's still no justification for Tonto's costume. It has nothing to do with Comanches' "bird culture." It's as fake as any white man who has ever put on a Halloween costume and called himself an Indian. Then there's this:For his part, Depp defends his Tonto, saying he was hoping to turn the stereotype on its head. "It's a very strange notion, but it occurred to me, in a weird way, certain cliches must be embraced for a millisecond, to have the audience understand. Just for that millisecond," Depp says.A millisecond? I think Depp means 2 1/2 hours. He's embraced the phony costume, accent, and "spirit guide" mysticism for the entire movie. LaDonna Harris defends casting of Johnny Depp over an Indian“There were a lot of complaints that he could’ve been [played by] an Indian, true, but then it wouldn’t have gotten the visibility that Johnny Depp could give it,” Harris told The Washington Post.Well, thanks for giving the ugly mistakes and stereotypes all that visibility, Johnny. How about performing in blackface next to give minstrel shows some much needed visibility? Visibility is the problem, genius. We don't want a white actor parading his mistaken and stereotypical notions of Indians in front of a billion viewers. Duhhh. Perhaps facetiously, a Facebook friend said:Hey what if Tonto wears the mask and Lone Ranger wears the crow? Switch it up a little!This movie could subvert the Lone Ranger mythos in several ways. Starting with changing Tonto's name and speech pattern. And yes, Tonto could be the one who had a relative in the Texas Rangers, who decided to become a masked vigilante. And the white guy could be his sidekick. That's what Johnny Depp would do if he really wanted to update the legend. Depp also could've honored Indians by hiring one to play the main role. You know, someone who was tall, dark, and buff, not short, light, and flaccid. Depp could've played the Ranger, the villain, or some other role. If Disney marketed the film as "Johnny Depp's Lone Ranger," it would've had the same cachet as this version of the movie. The same visibility. Clint Eastwood and Woody Allen get the same audiences whether they're in their movies or not, and Depp would too. So these excuses fail every test of credibility. Depp made a stereotypical movie and Disney, Harris, and the Comanche Nation enabled him. Way to promote Indians as sideshow freaks, people. Literally, not figuratively, if you count The Lone Ranger's opening scene. For more on Johnny Depp, see New Tonto as Racist as Old Tonto and Why Tonto Matters.